Comments: The 7-9 lobed, deeply incised serrated leaves have 3 seasons of color. New leaves emerge maroon maturing to green and then in fall a combination of green and red. 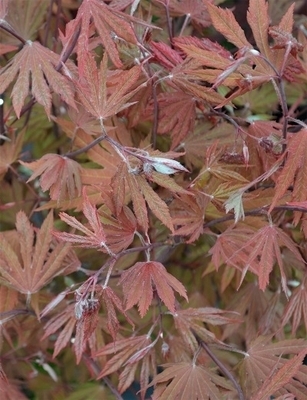 This originated as a seedling of A. circinatum in close proximity of several A. palmatum cultivars and is thought to be a hybrid of both. The translation means "color in all seasons".